In the quest to find great investments, most investors focus on earnings to gauge a company's financial strength. This is a good start, but earnings can be misleading and incomplete. To get a clearer understanding of a company's ability to earn money and reward you, the shareholder, it's often better to focus on cash flow. In this series, we tear apart a company's cash flow statement to see how much money is truly being earned, and more importantly, what management is doing with that cash. Step on up, Encana (NYS: ECA) . Next, we add back in a few non-cash expenses like the depreciation of assets, and adjust net income for changes in inventory, accounts receivable, and accounts payable -- changes in cash levels that reflect a company either paying its bills, or being paid by customers. This yields a figure called cash from operating activities -- the amount of cash a company generates from doing everyday business. Now we know how much cash Encana is really pulling in each year. Next question: What is it doing with that cash? There are two ways a company can use free cash flow to directly reward shareholders: dividends and share repurchases. Cash not returned to shareholders can be stashed in the bank, used to invest in other companies and assets, or to pay off debt. Not great. 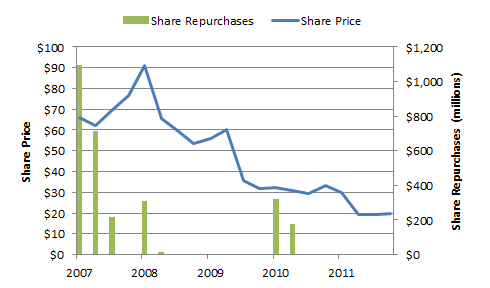 Encana repurchased a lot of stock in 2007 when shares were high, and pulled way back as they plunged. Whether this was a prudent way to save cash as it looked like the economy was about to implode, or a classic example of buying high and panicking low, is up for debate. In general, it doesn't appear management has been the most astute buyer of its own stock. Finally, I like to look at how dividends have added to total shareholder returns. Encana shares returned -67% over the last five years, which increases to -34% with dividends reinvested -- a nice boost to top off otherwise poor performance. To gauge how well a company is doing, keep an eye on the cash. How much a company earns is not as important as how much cash is actually coming in the door, and how much cash is coming in the door isn't as important as what management actually does with that cash. Remember, you, the shareholder, own the company. Are you happy with the way management has used Encana's cash? Sound off in the comment section below. Add Encana to My Watchlist. At the time this article was published Fool contributor Morgan Housel doesn't own shares in any of the companies mentioned in this article. Follow him on Twitter @TMFHousel. The Motley Fool has a disclosure policy. We Fools may not all hold the same opinions, but we all believe that considering a diverse range of insights makes us better investors. Try any of our Foolish newsletter services free for 30 days.